H Top Alexis Lloret de Mar, Hotel Spain. Limited Time Offer! Hotel TOP Alexis. The family-friendly "Hotel TOP Alexis" can be found in Lloret de Mar. It has been awarded 3 stars. To facilitate your travel in the neighbourhood there is a shuttle bus. Hot weather is kept outside the bedrooms thanks to the relieving air conditioning. 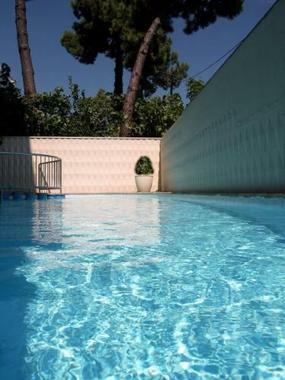 Feel free to take a dip in the outdoor swimming pool which is also suitable for children. There are recreational activities to make your stay more active, like parachuting and fishing. For visitors who appreciate getting in some sports practice, the residence also offers diving, surfing, tennis, squash, golf, volleyball, sailing, aerobics, horse riding, table tennis and dancing. The sports facilities include a gymnasium, motorboats, a playground, a water park and a walking trail as well as a bicycle rental service. For visitors' well-being, there is a whirlpool bath available. Besides, there is a sauna at your disposal. Dinner can be enjoyed at the onsite restaurant which proudly serves special dishes, and a regional and international specialties. You can end a busy day with a drink at the lounge bar. After a good night's rest, visitors have the opportunity to enjoy the residence's breakfast. Just 450 metres from Lloret de Mar Beach, H Top Alexis features an outdoor pool, jacuzzi and sun terrace. Each functional room has a balcony, air conditioning and satellite TV. This 3 star hotel is located in the city centre of Lloret De Mar. It is close to the Lloret de Mar Beach. The Hotel has an outdoor swimming pool. All 100 rooms are equipped with air conditioning.